We all like the idea of living longer. What we don’t want is to get old. New research is supporting the growing evidence that keeping active is the key to a healthy retirement. There has been an increasing discussion about raising the retirement age in Canada. Proponents have argued that delaying retirement will alleviate the financial and economic impacts of the large baby boomer population. A new study by the Institute of Economic Affairs in association with the Age Endeavour Fellowship aimed to understand what the health impacts of delayed retirement would be. Their conclusion can be broadened out to a key element for health retirement; one must keep active. 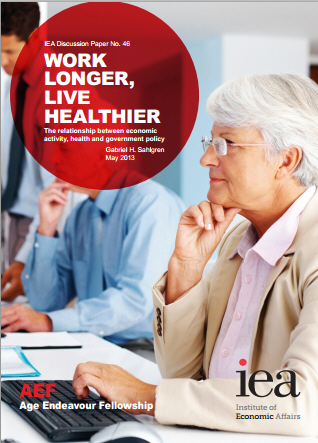 The report from the UK called Work Longer, Live Healthier: The relationship between economic activity, health and government policy states that “being retired decreases physical, mental and self-assessed health.” This report supports other studies that indicate that a low activity retirement with less physical and social activity has potentially negative health effects. A 2006 study in the Southern Economic Journal suggests that the lessening of physical, social, and professional activity leads to increases in illness, worse mental health, and more problems with mobility and activities of daily living. In 2009, a German study utilizing the English Longitudinal Study of Ageing (ELSA) found a similar association. It is important to realize how they are defining retirement. In general, retirement is used in the context of post-employment and a concomitant decrease in physical and social activities. In some studies the words ‘complete retirement’ are used to denote a significant drop in activity. The premise is that people in post-employment situations are less physically active and have lost a social component to their lives. The UK report concludes that retirement leads to a “significant worse health trajectory and that the length of time spent in retirement is also detrimental to health.” There were little differences between men and woman as they noted the following outcomes. decreases the likelihood of being in “very good” or “excellent” self-assessed health by 39 per cent. increases the probability of suffering from clinical depression by 41 per cent. increases the probability of having at least one diagnosed physical condition by 63 per cent. increases the probability of taking a drug for such a condition by 60 per cent. The authors of the UK report conclude that the “evidence thus indicates that old people benefit from continuing in some form of paid work for longer instead of retiring entirely.” This is presumably so that they can maintain physical and social activities that will keep them healthy. These studies focused on post-employment health outcomes in “completely” retired people. The studies underline that coasting to a sedentary lifestyle as described in these studies leads to deteriorating health. Although you may not want to resume paid work, it is important to note that the studies all point to participation in physical and social activities as the ingredient in a healthy retirement. Next Clearly, Boys are not Little Men!